Through Wind Powering America, the United States will achieve targeted regional economic development, enhance our power generation options, protect the local environment, and increase our energy and national security. Wind power could provide 20% of U.S. electricity needs by 2030, according to a new DOE report. 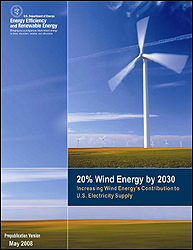 The report, titled "20% Wind Energy by 2030: Increasing Wind Energy's Contribution to U.S. Electricity Supply," identifies the steps that need to be addressed to reach the 20% goal, including reducing the cost of wind technologies, building new transmission infrastructure, and enhancing domestic manufacturing capability. For more information, see the DOE press release, the 20% Wind Energy by 2030 Web site, and the full text of the report (PDF 4.0 MB). Download Adobe Reader. After reaching 1,000 MW of wind energy in 1985, it took more than a decade for wind to reach the 2,000-MW mark in 1999. Since then, installed capacity has grown fivefold. Today, U.S. wind energy installations produce enough electricity on a typical day to power the equivalent of over 2.5 million homes. You can view a larger version of this animation or you can view individual years. Wind Powering America concentrates its efforts in "stuck" markets, i.e., avoids investing resources in markets that are fully commercial and active; develops innovative pilot projects; replicates successes; and develops and disseminates targeted information, analyses, and tools — WPA augments the efforts of DOE's wind research program, the American Wind Energy Association (AWEA), and other wind related organizations to identify and address gaps in technical information and tools needed for its program areas. Examples include: development and access to simplified spreadsheet tools for initial analyses of wind project economics and economic development impacts, development and distribution of state specific wind maps and small wind application guidebooks, and publication of a brochure that focuses on wind opportunities, case studies, and economics for rural electric coops. Visit our state pages or use the navigation to the left to access each of these resources. 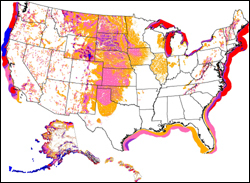 Wind resource maps help to evaluate whether an area of interest should be further explored.